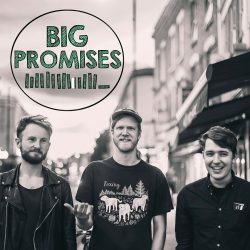 London DIY punks Big Promises release their new EP Are We Kidding Ourselves? on 15th September. Featuring members of Great Cynics, The Buzzard Orchestral and Fighting Fiction. The trio’s debut EP hints at influences from bouncy guitar driven acts like Martha, Joyce Manor, Jeff Rosenstock, Against Me! and Beach Slang. It’s the kind of EP you can fall in love with immediately, short snappy UK punk done to a tee. Opener and title track ‘Are We Kidding Ourselves?’ is three minutes of gloriously infectious punk. Raucous and driving, it’s matched by the raw punk of ‘Staircase Wit’. Coupled with the immediate ‘Every Waking Night’ and defiant ‘Another Uniform’ you get the impression that this is just the start of a very promising career for Big Promises. It might be a bit rough around the edges but that just lends it a little more charm. Keep your eyes on this band.